Summary: It is the last decade of the 19th century. The Wild West has been tamed and its fierce, independent and often violent larger-than-life figures – gun-toting wanderers, trappers, prospectors, Indian fighters, cowboys, and lawmen –are now victims of their own success. They are heroes who’ve outlived their usefulness. In THE FLOOR OF HEAVEN: A TRUE TALE OF THE LAST FRONTIER AND THE YUKON GOLD RUSH, author Howard Blum traces the lives of three seemingly unrelated characters and brings them together in an exciting conclusion with the Yukon gold rush as a backdrop. Jefferson “Soapy” Smith was a cowboy turned con-man. Smith earned his nickname from a scam he ran persuading people to bid on a bar of soap with the promise that some would contain a $100 bill. He also ran shell games and other con games. He wore out his welcome in most places and ended up controlling the illegal activity in Skagway, Alaska, the gateway town in the Yukon gold rush. George Carmack was a marine deserter who married into the Tagish Indians in Alaska and actually considered vying for the position of Chief of the Tagish tribe. Like his father before him, he always dreamed of finding gold. After many disappointments he and two Indian friends found gold in Alaska and set off the famous Yukon gold rush. The third character in this saga was Charlie Siringo, a cowboy who became a Pinkerton detective in the hopes of adding new adventures into his life after his cowboy days were over. Siringo traveled to Alaska and worked as an undercover agent to solve a crime involving gold theft from a local mine. The pursuit of one of the thieves led him to Skagway. Blum spends a considerable amount of the 407 page story in setting up the characters from their early years up until the gold rush. He moved smoothly back and forth from one character to another amusing the reader with countless stories. He tells of Smith’s escapades in Colorado and Carmack’s life as a marine and later living as an Indian. Blum relates stories of Siringo’s cattle drives and his effort to settle down, marry and run a tobacco store. He weaves in mentions of Billie the Kid, Bat Masterson and other notorious characters of the Wild West. The three men’s lives intersect in Skagway in 1898 in an armed clash when Soapy Smith and his outlaw gang set up a plan to steal George Carmack’s gold not knowing that Charlie Siringo is an ally of Carmack. Howard Blum uses memoirs, news accounts and memories recorded from descendents of the three main characters to develop his true story. Although it’s classified as an historic narrative some questions may arise as to the truthfulness and accuracy of the reference documents. After all, Smith was a con man whose life centered on lying, Siringo often misled people in his job as an undercover detective and Carmack was a marine deserter who lied to avoid arrest. Additionally, with high profile characters like these three, information often gets exaggerated as it’s passed on over time. There is no real way to know. 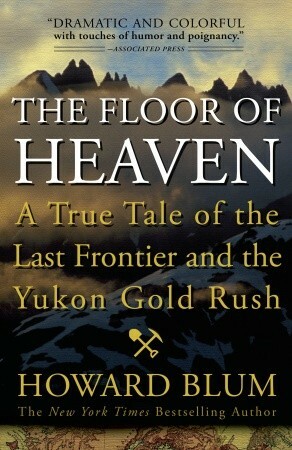 Nonetheless THE FLOOR OF HEAVEN is a very enjoyable book that gives the reader a great perspective of the Yukon gold rush and its impact. I recommend it to anyone with an interest in the history of the Alaska gold rush period. I bet reconstructing things from that time period would be difficult. The book sounds interesting! Sounds kind of fun -- Charlie Siringo is a popular figure in our house so I need to get this one for my wife!